Spring is here, we’re coming out of our winter hibernation and it’s time to wake up our children’s senses through play – whatever their age. Let’s all see more, touch more, smell more, taste more, hear more and learn more this month with activities for one and some fast & furious family games. This top quality 72-piece puzzle is not as easy as you think. Build it and then start counting and marking off what you can see within the puzzle on the four scoreboards that are also the corner pieces of the puzzle. Use the whiteboard marker provided. It’s a little bit like ‘Where’s Wally’, but much more exciting! 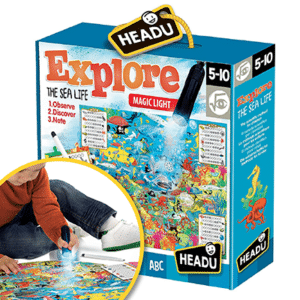 In addition, there is a magic UV torch that will help your child to reveal additional hidden items in the picture, making them feel like a real explorer. Puzzles that wake up the sense of smell! 4 x 24-piece puzzles with four scented markers – banana, chocolate, strawberry and green apple – yummy!) Colour in the blank parts of the puzzle with the matching marker. 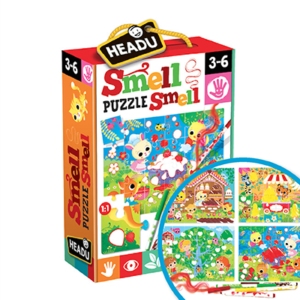 Your child will be matching colour and smell while benefiting from all the skills to be learned in puzzle building. 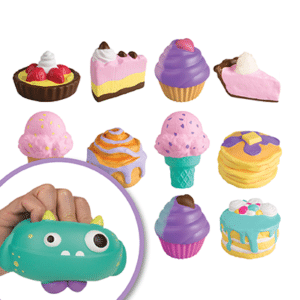 Squishies™ provide for sensory exploration in an increasingly screen-based world that ignores many of the human senses. The motion of squeezing and releasing is very therapeutic. 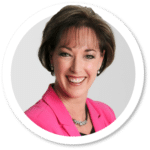 The squeezing is a form of deep pressure and that stimulates the proprioceptive sense, sending information and sensations to the brain via the muscles and the joints. Therapists often use deep pressure when children need calming. And, let’s face it, we live in a frenetic world and can all do with a bit of calming down! AGE: 6 years to adult. Bubbleezz™ form part of ORB’s tactile collectibles and are also fabulous sensory toys loved by both kids and therapists alike. 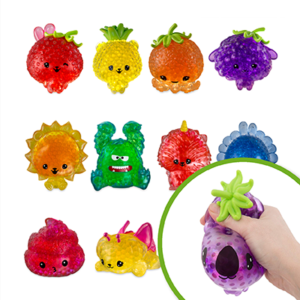 Bubbleezz™ come in a series of adorable semi-translucent characters filled with wiggly, wobbly Bubbleezz Beadz™ that create a silly satisfying feel when squeezed, transforming as they flow and grow in your hands. When dropped on a surface they also create a splat-type effect without bursting. Available in super and jumbo sizes and loads of characters! 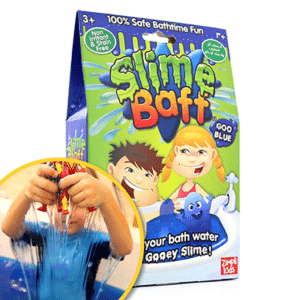 Slime Baff turns your bath water into a gooey, oozy bath of slime. By just adding more water, the slime can be diluted into coloured water that can be safely drained away. Slime is trending massively worldwide as children hanker after more sensory experiences to soothe them and balance their on-screen time. 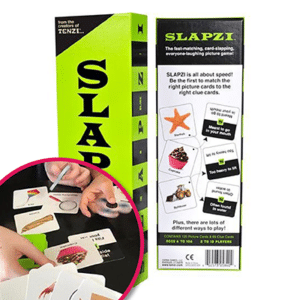 This game really appeals to me for developing counting, sorting and matching skills as well as number recognition, while having fun with the unique squeezy tweezers. 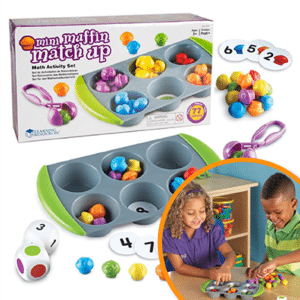 This is a pre-maths game that also develops eye-hand co-ordination and fine motor control. Your kids will love sorting and counting the mini muffins in the baking tray. Use the number and colour dice, and discs, for more advanced fun. Have fun and hysterics as players are challenged to hum tunes so their team mates can recognise them. There are hundreds of tunes that will have wide appeal to both young and old. 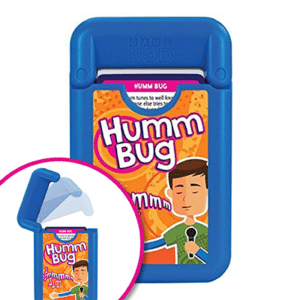 This deck of cards, in its unique and durable plastic card holder, makes it a perfect game to pack for the car or when going away on holiday. 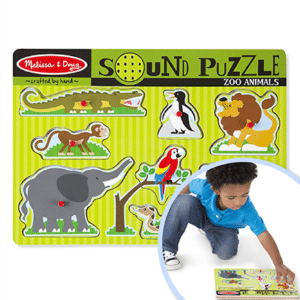 Melissa & Doug’s wooden sound puzzles make for a rewarding first puzzle experience. Knob or peg puzzles make it easier for children to position the pieces correctly in the matching hole. And when they make a correct match, the puzzle plays a sound or a song for instant feedback. This positive reinforcement – action and reaction – encourages a child to do the puzzle again and again, building confidence in their ability. Available in loads of different themes. Be the fastest slapper in this speedy picture and word association game with multiple game variations. Match your picture cards to the clue cards in the middle of the table by slapping them down as fast as you can. Brilliant for families with 10 year olds and up. Highly competitive. Really wakes up the brain! AGE: 10 years o adult. 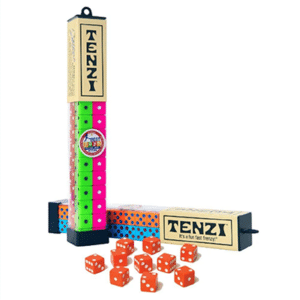 Tenzi is the world’s fastest dice game with 75 ways to play. Everyone gets ten colourful dice and you keep throwing them to match the goal of ten 6s, or 5 3s and 5 4s, for example. Keep the dice that match the solution and rethrow the rest as fast as you can. Some challenges require that you stack your dice as you throw the right number. Great fun. Play anywhere. It’s Tenzi Frenzy! 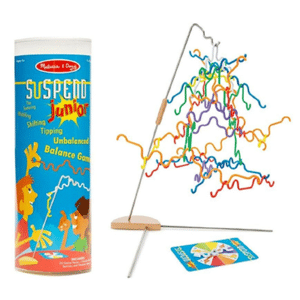 Suspend is a most unusual game requiring fine motor skills to get the balance right. Spin the spinner that will tell you what colour piece to add to the balancing act. Kids learn how to balance and counterbalance, take smart risks, and foresee consequences while having lots of fun. Whatever falls off, is yours. The first player to use all their pieces is the winner. A family game of tricky hangs and steady hands. Try this hanging balance game and you’ll be hooked. 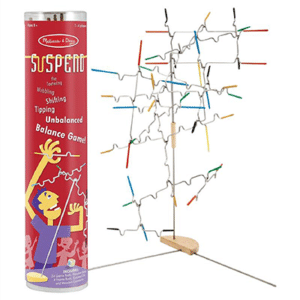 Suspend comes with 24 notched, rubber-tipped wire pieces to hang from a table top stand and a dice which provides instructions. Sound easy? Try adding another piece! Each time a bar is added, the balance shifts, the difficulty changes and the incredible mid-air sculpture transforms. Whatever falls off, is yours. The first player to use all their pieces is the winner. Bring the town to life by rubbing dozens of stickers onto two illustrated scenes. Position the transfer sheet of stickers and use the wooden stylus to rub on the back, then peel away to reveal the animal or object you have transferred onto the scene. Transfer stickers help to develop fine motor skills and provide sensory feedback on how hard to press which helps with handwriting. The harder you blow, the faster they go! 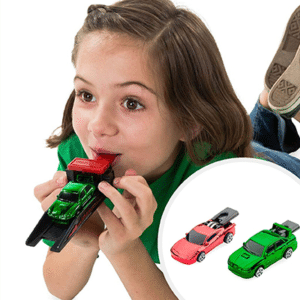 The Whistle Racer is an interactive metal die-cast car that is powered by blowing. It’s not as easy as you think which is why we recommend it for children from 6 and up. Have great fun and for stimulating all the muscles in the mouth, cheeks and tongue for good speech. Many colours and models available. ‘Sand’ that can be squished, squashed, squeezed, moulded, cut and dripped. Sand that works like playdough. 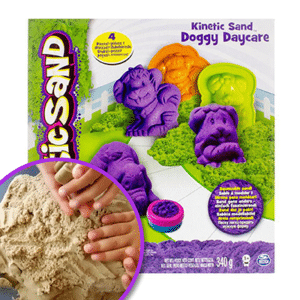 Kinetic Sand provides an amazing sensory experience that will both stimulate and soothe the sensory system (try it yourself!) as well as providing opportunities to exercise and develop fine motor skills and creativity. Kinetic sand never dries out, stays dust and allergen free, is naturally antimicrobial and gluten free, leaves no residue and hands stay clean. AGE: 3 years and older. Available in assorted themes and moulds. 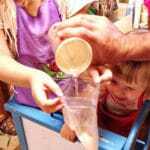 sensory activities/recipes to do with your kids! A super fun holiday activity making Astronaut space pudding in Zip Lock sandwich bags. A sensory activity that is as easy as 1, 2, 3 to do with your children at home. Kids from 3 to 7 years of age will love this. This activity will stimulate the senses of taste, smell and touch. The melting marshmallows in the cooking process will have your child fascinated. 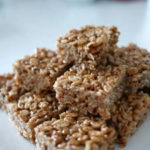 Then let them help you turn the mixture into neatly cut crunchy squares that provide an overwhelming sensory experience for the mouth, teeth and taste-buds.